With this collection, Amy wanted to challenge what we see as a precious material. Her strong designs came as a direct response to experiences showcasing her Chains and Brutalist collections. Whilst exhibiting the collections Amy found so many visitors were afraid of her work, afraid to wear what is actually such a common material. The conversations had sparked a great interest in, why? Why does this common material cause such a response, and what is so different about wearing cement, than wearing a gemstone? The predominant materials found in this collection are cement, brass, silver and steel. Designs in this collection have been inspired by research into historic and royal jewellery, and traditional stone cuts. 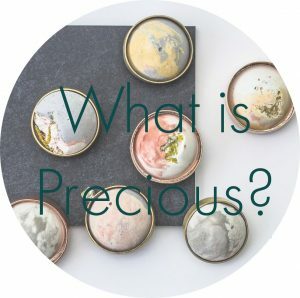 Amy explores the designs of the most valued jewellery in the world and creates the perfect juxtaposition by re-imagining them in what are thought to be basic, common materials.